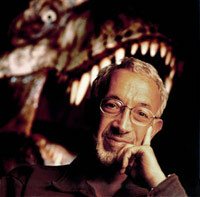 Legendary -- legendary -- special effects makeup guy Stan Winston has died. Major bummer. He did the effects for the greatest horror/thriller movie of all time, "The Thing". In a skeptical turn, he was misused in the Fox TV show "Alien Autopsy", saying he didn't know how they could have faked it. However, later it came out that his real opinion was "Do I think it's a hoax? Absolutely." My kinda guy. He won Oscars for "Terminator 2", "Aliens", and "Jurassic Park". Even if you don't know his name or his face, you know his work -- which is extensive and amazing. He was one of the greatest entertainers behind the camera of all time. Tip of the doffed latex mask to Ain't It Cool News.